We get these frequently on our carrots. I usually take them in in a jar as soon as I notice them, because they get preyed on by parasitic wasps otherwise. I managed to save about 12 last fall, and picked wasp eggs off of them with tweezers (a very delicate operation!) Two died and never pupated, one appeared to be developing wasp larvae (there are telltale signs in the chrysalis), so I destroyed it. The others pupated and overwintered in my garage. I have had four emerge so far. They all look like this one and I'm mystified too as to whether they are male or female based on the markings. 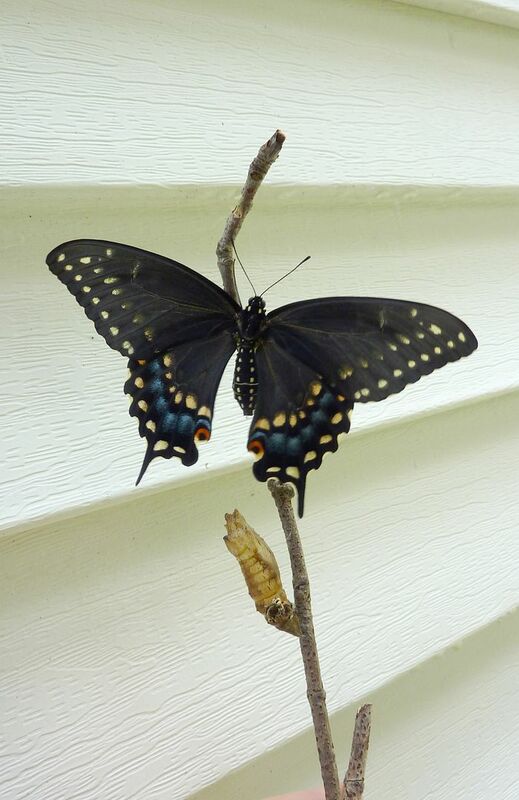 Females to most Swallowtail butterflies have more blue on the wings. Males of this species don't have much blue at all, and the yellow spots will be thicker forming a more pronounced V.